Is it fair to wonder whether Barcelona has two patron saints to squeeze yet another holiday into the annual agenda? The festival of Santa Eulàlia Barcelona dates back to the 3rd century AD, when the young martyr Eulàlia was brutally murdered and martyred as a young child for not refuting her religion. Her statue looks down from the top of Barcelona Cathedral onto the square, which hosts many activities. A myriad of shows, dances and folkloric performances take place during these festive days of Santa Eulàlia Barcelona. Highlights include the human castles in Plaça St Jaume who reach for the skies on Sunday afternoon. Also on Sunday, the traditional gegants of Ciutat Vella, large sculptures that tower above the shoulders of their bearers, take a twirl in Plaça Reial. 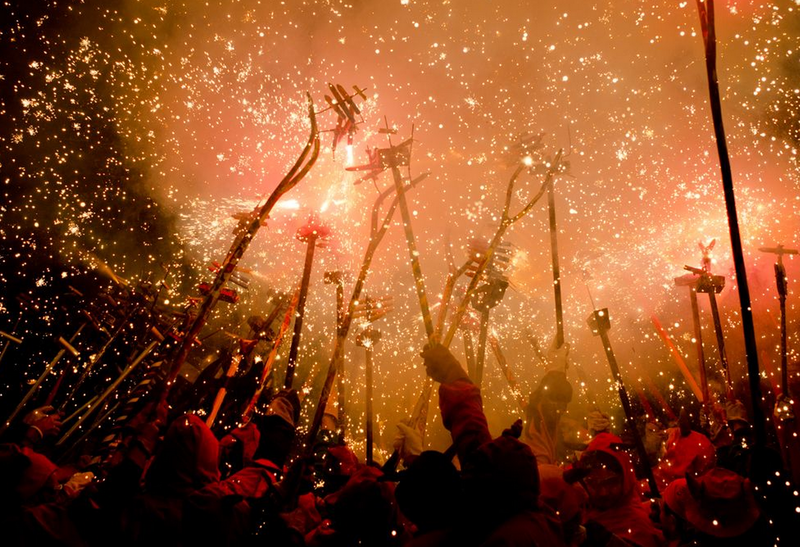 One of the most dramatic events will be the correfoc fire-run route which departs from opposite the Cathedral at in the evening. Immerse yourself in the action!